A few weeks ago, members of uOttawa Students for Life did some chalking around campus, helping to bring messages of truth and of love for preborn children and their mothers to our fellow students. This chalking approached street art, which is appropriate given that it was mostly done by Angela Richmond, our resident visual arts student. Sad but true facts on the pedestrian mall. An affirmation on the walk-way between UCU and MRT terrace. This entry was posted in advocacy, apologetics, children, events, for your information, inspirational and tagged abortion, activism, uOttawa on October 24, 2014 by uOttawa Students For Life. The National Post recently published a very informative and sobering infographic that breaks down the number of abortions that happened in Canada in 2009 by province and age of mother and child. (Note that the data underestimates the number of abortions because they’re not all reported.) What will you do to help decrease the number of preventable deaths where you live? On a similar note, it was recently reported that 491 babies were born alive and left to die following botched abortions in Canada from 2000 to 2009. Have you emailed your MP? This entry was posted in abortion, advocacy, children, for your information and tagged abortion, Canada, Canadian Institute for Health Information, gestational age, graphic, national post, statistics, WeNeedALaw on December 14, 2012 by uOttawa Students For Life. Christmas Baby Shower This Sunday! Here at uOSFL, we are not just about trials, struggles, and controversy – although those are a given in our battleground! We are also about celebrating life, the gift of life, the joy of life! We are pleased to announce our next Joys of Life event – our annual Christmas Baby Shower! It will be held this Sunday, December 9th, from 2pm to 5pm in Café Alternatif, 60 University Private (basement of Simard building). There will be food, mingling, and games. Bring a snack to share and a friend, and most importantly, bring a gift for a mother facing a difficult pregnancy! Gifts will be donated to First Place Pregnancy Centre. *UPDATE: clothes for babies 0-3 months, winter clothing and diapers are most appreciated. This event is hosted by the University of Ottawa Students for Life, your pro-life club on campus. For more information, please visit our Facebook event and follow us on Twitter at @uosfl_epvuo. This entry was posted in children, events, support and tagged baby shower, events, First Place Options, mothers, support, University of Ottawa, uOSFL on December 6, 2012 by uOttawa Students For Life. Saturday’s workshop by Kathleen Gray of Montreal’s Centre for Reproductive Loss was full of practical insight and wisdom. So many families are affected by losses such as miscarriage, stillbirth, abortion, adoption, SIDS, infertility and sterility, and yet we have so few opportunities to express sympathy for the parents who experience very real grief. We shouldn’t be afraid to acknowledge reproductive loss; in fact, it is critically important for healing. Those interested in learning more about the Healing Process Model © should request a copy of Grieving Reproductive Loss: The Healing Process. 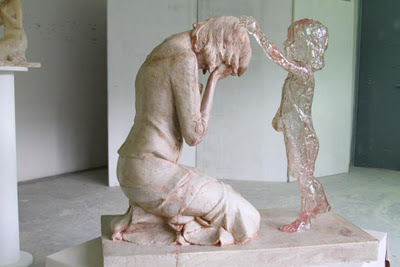 This work of art gracefully represents the sorrow felt by so many. Sculptor Martin Hudáčeka was commissioned by a group of mothers in Slovakia to create The Child Who Was Never Born. This entry was posted in abortion, children, events and tagged abortion, Centre for Reproductive Loss, infertility, miscarriage, Resources, SIDS, stillbirth, The Child Who Was Never Born on November 5, 2012 by uOttawa Students For Life. He sat me down and told me I needed to have an abortion. My whole world came crashing down again. I have never cried so hard. I was lost, and the only man I knew truly loved me was telling me to do the same thing the boy I thought loved me said to do. I stood toe to toe with my father and told him no. I had more respect than that for myself and for God. I’m so glad I chose life and gave Brett a chance at a good and happy life. He is a gift to everyone, and even though it was hard, I would never take back the journey I went through. I’m stronger because of it. Here in Ottawa, FirstPlace Options, Birthright and Miriam Centre can provide information about local adoption services. AdoptioninCanada is a great website with information about the adoption process. This entry was posted in adoption, children and tagged adoption, birth mother, Birthright, coercion, FirstPlace Options, Live Action, Miriam Centre, Ottawa on October 29, 2012 by uOttawa Students For Life. Yes, this clip is American, however, the message is just as relevant. Abortion kills a defenseless human being while wounding another. And no amount of rhetoric can change that. If we do not uphold the right to life, all other rights are irrelevant. This entry was posted in abortion, children, fetal development on July 17, 2012 by uOttawa Students For Life. Who Wouldn’t Want This Precious Little Boy? Check out our post on Down Syndrome and Abortion if you missed it. This entry was posted in adoption, children and tagged adoption, Down Syndrome, siblings, World Down Syndrome Day on April 19, 2012 by uOttawa Students For Life.